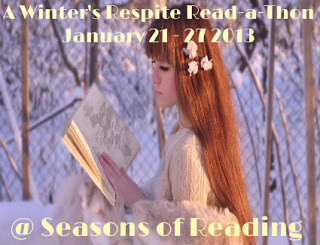 Laurie Here - Contemporary Fiction and MORE - Book Reviews: Winter's Respite Read-A-Thon UPDATE! CLICK ON THE WORDS AND IT WILL TAKE YOU THERE! Watch the DATES! Good Luck! A Winter's Respite Read-A-Thon! NOW to Sunday, 1-27-13! Hello everyone! Thought I would give you all an update as to how I'm doing with my Read-A-Thon! I STINK! Come on over and read how my week has gone! Monday, Tuesday and Wednesday I did not feel well. Tuesday: Exciting day! First, the Dentist - YUCK! After that, I went for my Allergy shot, and ALL I did the REST of the DAY was SLEEP! I also have a blind spot in my left eye. I've had it all checked out, and found out I have a crooked Optic Nerve! That started in July as a black spot, and now it has lightened up to a beigey/white spot. I can notice it more in the white shower, or out in the sun, especially against the snow! Wow! Anyway, ALL this time I've been worrying! I went to one Eye Doctor, which led to another, and another! Finally at the Retina Specialist, he told me my Optic Nerve was crooked. I don't know if this is good or bad? Of course I don't get to see my Opthalmologist for an explanation until September!!! UGH! WHY do they have you see a doctor, then he NEVER explains ANYTHING to you as to WHY you have a blind spot??? Am "I" supposed to be able to figure this out on my own? This is wrong - making you WAIT until your next appointment! I'm complaining! Anyway, since I've had these NEW glasses, the blind spot is NOT as dominant as it was! Wow!! COOL with me!!! I learned a second thing! When you get a new prescription for glasses, get them! Don't wait! I had this script for about 6 months now, and just didn't take the time to go grab a new pair, nor did I want to spend the $200! Now that I have, these are GREAT! They are a brown frame, and the front corners and side arms have scroll-work, and it looks antique, which I LOVE! They ARE beautiful! Wow! I'm impressed! I go to Shallcross Optical, here in Port Huron. The man who makes the glasses right there IS AWESOME! The wire frame on my glasses snapped last Thursday as I was on my way out the door to go to a Dr appointment! He can WELD MY GLASSES, AND YOU WOULD "NEVER" KNOW IT! He is AMAZING! Honest to God, you can't even SEE the weld! If I can suggest something. Find a 'glasses store' that MAKES THE GLASSES ON SIGHT! AND "NOT" THOSE PLACES THAT MAKE THEM IN 1 HOUR! When I went there, the Opthalmologist's office could NOT READ MY PRESCRIPTION FROM THE LENSES OF MY GLASSES! NO KIDDING! They were AWFUL! Find a guy who specializes in making glasses! There are a LOT of them out there, the trick is finding them! Once you do, once you get those glasses, you'll see what I'm talking about! There is nothing like them, ever! This place has been in business for 60 years, and his own father taught him HOW to make glasses! He's AMAZING! So are the two women who work there! We don't even use our insurance there because it costs MORE WITH INSURANCE than it does just to pay cash! I am in LOVE with these *NEW* glasses! Both women who work there are DOLLS, but the one who helped me pick these were the FIRST frame SHE chose for me! I'm SO GLAD she did! At first I was skeptical, because the frame is brown, and I was worried I would feel like I was looking through a box, but nope! It's as if it's my hair! No problem! I had had a silver frame, which I think made me look older as I look at some photos I have. These are AWESOMELY AMAZING!!!! LOVE!!!! I have double vision. NOT 'one' set, but 'TWO' sets of double vision with shadowing, to be exact! (They cannot correct the shadowing, so the prisms in my glasses cannot correct the shadows from the double vision. It gets quite tricky!) Try waking up OR going without your glasses, and focusing your eyes!! LOLOL!!! You can't! You can try to pick out which '1' object or person of the '4' you are seeing, and none of what you chose is it! LOL! I got this when I got hit with the Neurological Muscle Disease I have, which i mention down below. I don't know if a fall I had caused it or not? I just thought about that because of the crooked Optic Nerve! This disease causes you to fall, and a LOT! My latest was this week, trying to get in the shower! I used my WEAK leg to step in. WHY did I do that? DUMB!! My right leg is my weak leg, and I NEVER use that leg to step in the shower! Why I did that, I cannot even guess but that the water was too hot, and I was trying to add cold and NOT get hit with the HOT water! So I did not get my leg up high enough! When I fall, I tend to go backwards. Thank GOD for the shower curtain! I was lucky, too, because it's only a spring loaded rod! However, I did learn something about myself that had I NOT done this Read-A-Thon, I would not have noticed these things, especially the allergy shot! When I get my allergy shots, (I called the doctor and asked about this!) my immune system goes a little crazy because it's working overtime from the shot! I NEVER knew that! Interesting! I tried reading a little here and there, and got a little done, but I would fall asleep! UGH!!! Drives me CRAZY when I do that, but, it's out of my control. Since I learned this, now I won't be so hard on myself if that ever happens again! (It has in the past, when I've had days I just cannot stay awake! Between the allergy shot and the neuro muscle disease, well, my immune system goes a little crazy! Who would have EVER thought?! Okay - the neurological muscle disease I have is called "Stiff Person Syndrome". It makes your muscles go completely rigid/stiff, then they spasm out of control causing muscle spasms throughout your body. PAINFUL!!! I was suffering from those, too, this week. Heck, I ALWAYS have some sort of spasms going on. The bummer part about that is you NEVER KNOW when this disease is going to hit hard! It hits out of the BLUE! Yes, I had that going on, too. Bummer! Tuesday AND Wednesday were the worst! Wednesday - Still not feeling well! Thursday - SURPRISE SNOW DAY!!! My son came over DURING THE DAY!!! Why? School was CANCELLED because of a snow day! WE got MORE snow, Lake Effect snow, than what HE got 2 cities south of here! Turns out they only had a 1/2 day of school anyway, as their marking period was over, so they just called it a Snow Day! RUINED MY READING DAY!!! Although, in weighing what is more important, almost ALWAYS it's our kids, so . . . my son won out! Friday, TODAY! My son is still here! That's okay! I LOVE the bejeevers out of him! I had NO CLUE he had today OFF and he would be here! He didn't tell me! SURPRISE!!! (I kind of figured when he came over yesterday that he would have today off, but, with him, you never know!) He is 'hanging out' with his buddy, but they keep coming over! Guess what? They FINALLY figured out to TAKE THEIR SHOES OFF before walking on the carpet!!! HOORAY!!!! They just stopped in again to grab a drink. They have Air Soft guns, and go out into the woods and shoot, have war games, etc. They LOVE those Air-Soft guns! They dress up and look like little military men! He was here until this afternoon till about 2:00pm'ish, then headed over to his buddies house. He just lives through the backyards of the few houses across the street. Guess what? I'M READING NOW!!!! That is, until they stop in again! And, HERE THEY ARE!!! Oh, my reading! WHAT reading??? LOL!!! My son has ADHD and OCD. TRY reading with that around! YOU CAN'T! LOLOL!!! I LOVE my son dearly, but TRY to focus on reading, and it's a NO-GO! He lives with his Dad through the week, and is usually always here on the weekends! I LOVE IT WHEN HE'S HERE!!!! I LOVE HIM DEARLY!!! But trying to read, well, it doesn't happen! Drives me crazy!!! He was even watching something on the Kindle Fire, and STILL TALKING!!! LOL!!! Well, my husband works Afternoons. He hasn't been getting home until 2:00AM this week! Wow!! It'll be me and the boys tonight! Time to renew my Netflix account, OR, use Amazon Prime! So, where AM I on my list? Here is the list below, and I'm SAD to say I'm STILL on book #1! 1. Mystery Book #1: I am starting off with a title I cannot yet reveal, per the author! This is TOP SECRET! I'm just SO EXCITED about this book!!!! LOVE the author who has written it, too, and can't WAIT to dig in! So, I figure I'll call it "Mystery Book #1" being it's the FIRST book I'm reading! 2. Gone Girl by Gillian Flynn (I've had this for a while, but ALL of my Review books have prevented me from finishing it! I'm on page 75 or 100? I AM finishing it THIS WEEK! I've been DYING to read it, just DYING! Here's my opportunity! So we'll see how far I get??? Okay - I'm going back to reading! Oh! Dinner tonight will be rice and LaChoy Chop Suey in the can! Does anyone like that as much as I do? I LOVE that stuff!!!! That, I CAN make! Usually I can't stand long enough to cook, but that goes SO FAST! The rice is a breeze to make, and you just warm up the gravy and veggies! LOVE it! Guess what? I was just in the kitchen, and my husband bought the WRONG ONE!!! HE BOUGHT BEEF! NOT CHICKEN!!! UGH!!!!! NO!!!!!!! I can't drive to go to the store, and I HATE BEEF!!! I HATE ANY MEAT, FOR THAT MATTER!!! But, I CAN LIVE with chicken! Beef! Beef! UGH!!!!! Dinner is ruined!!!! UGH! What am I to do??? READ!!!!!!! HA!!!!! Cook frozen pizza rolls!!!! LOL!!! Me, too! My son is over, so . . . that is questionable! LONG story! I think you know a little of it! Although, he's going home EARLY!!!! His attitude, wait, teenage attitude, got him in some pretty BIG trouble tonight! So, we'll see? I hope YOU get some time in to read! How'd the unpacking go? Well, I hope! Hopefully you won't have to repack soon!